Anytime I’m telling someone about my trips to Thailand and how good the food is I always get the same response, ” I don’t like spicy food”. People seem to think that all Thai dishes are spicy. While a good many dishes in Thailand are spicy or can be made really spicy, including hot dogs, there really is a wide selection of dishes that aren’t spicy or you can ask to have them made less spicy. One of my favorites, because us falang can’t handle spicy, happens to be Kai Pad Med Mamuang Himaphan or Cashew Chicken in English. A light dish with just a hint of spicy…unless of course you gobble down the large red peppers mixed in. The small amount of fish sauce and chilli paste in the dish really compliments the taste without over powering your taste buds. So the next time you are out and about looking for a restaurant to eat in give Thai a try, you’ll be surprised at just how varied Thai dishes can be. Looks yummy! 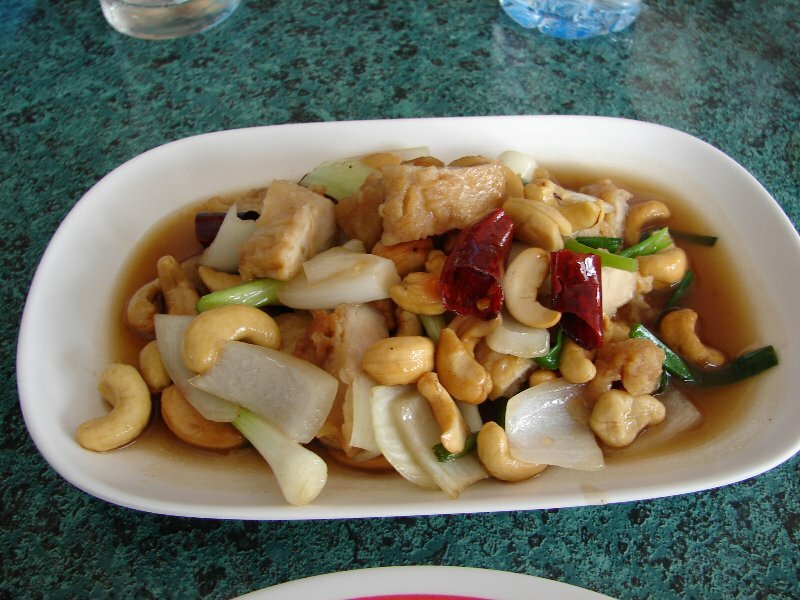 This looks like something we have here called ‘kung pao’ chicken. Stir fry pieces of chicken with dried chillies, bell peppers and onions. I think this dish originally came from China a long time ago and the Thais made little adjustments to the recipe. I can handle a yellow or green curry and the Kai Pad you mention. Anything spicier than that and I really am out of my league. When I head for the village I stop off at Tesco Lotus and stock up on steaks, chicken, french fries and lots of western snacks. God bless Tesco Lotus. Forgot to mention. I had a lovely review on Stumble Upon by someone named monkeybrainstoo, my hit counter went through the roof. If you happen to bump into him when you are shaving, give him my thanks. I’ve found a lot of Lao dishes up in Mukdahan to be really good but a few of them are like molten lava. I’ll never forget the first time I had Som Tam…ouch. The one thing I hate to do is eat the same western junk I have at home. It’s hit or miss but I find more and more Thai dishes that are really good but not too spicy. Man, first you make fun of my Monk and now you call me a Monkey… At least you didn’t call me Dah Ling. All the food dishes you post make me hungry. It’s a love/hate relationship I’ve got with your website. Ah heck, keep it up.